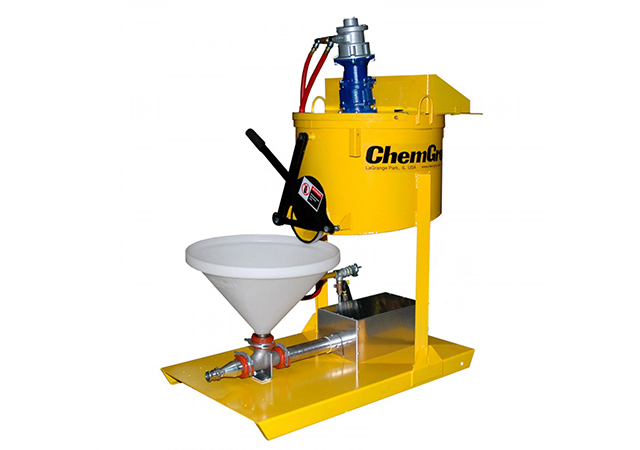 The ChemGrout CG-550P is a complete grouting system, that provides continuous operation by combination of high efficiency paddle mixer and the field proven 2" positive displacement piston pump. The skid mounted CG-550P features 5 gallon holding hopper and 34-gallon mixing tank equipped with baffles, bag breakers and a variable speed high-efficiency paddle that insures rapid and thorough mixing. The CG-550P has hydraulic and air driven options, which gives the user flexibility of choice based on the site requirement. The CG-550P has rugged steel framed system, stands up to the toughest job site conditions and can be easily transported on pick up trucks. CG-550P gives an output of 5 gpm at maximum pressure of of 225 psi for air and 400 psi for hydraulic powered pumps.